Prior to the 19th century, the word temperance connoted moderation and restraint in appetites and behavior. 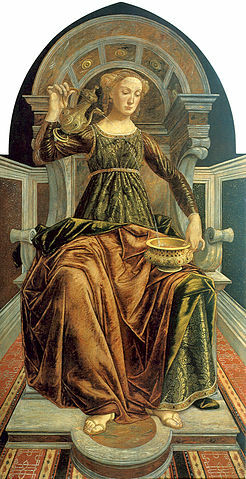 Representations of the Virtues frequently depicted Temperance as a woman pouring diluting water into a wine cup. 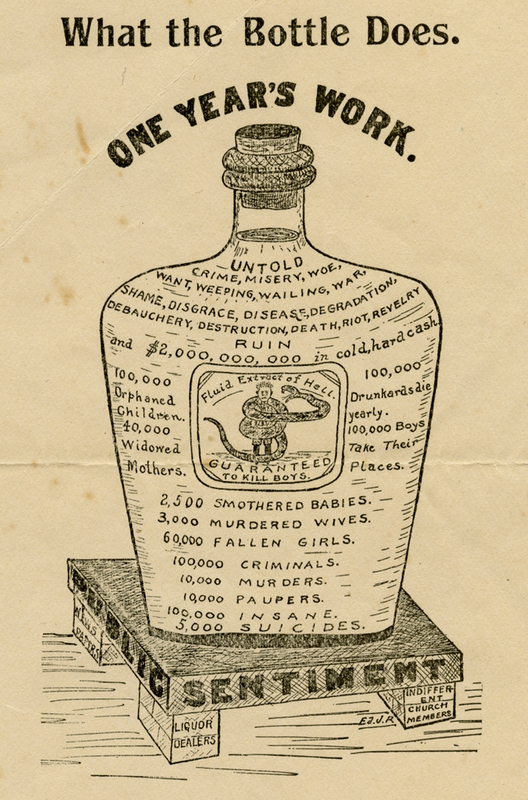 Early Temperance advocates in America urged the avoidance of liquors in favor of less intoxicating beverages like beer or wine; many people believed that small amounts of alcohol could be beneficial for one’s health. (Stearns, 1994). Restraint, however, did not characterize America’s behavior. By 1830, the average American over 15 years old consumed nearly seven gallons of pure alcohol a year – three times as much as we drink today. Among urban factory workers, this level of intoxication created unreliability in the labor force, dismaying employers. 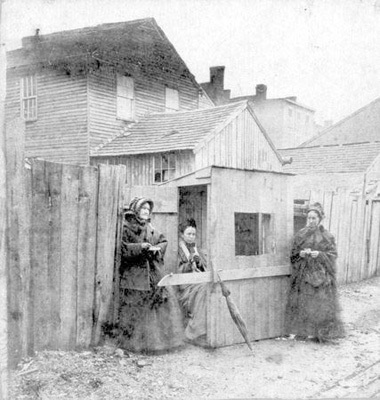 At home, women and children often suffered, for they had few legal rights and were utterly dependent on husbands and fathers for support. (Burns & Novick, 2011). 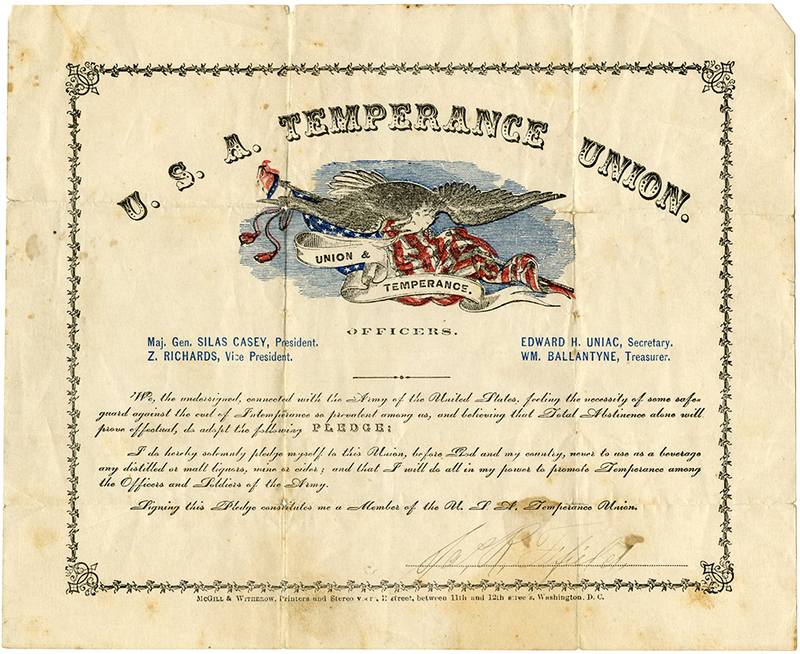 During the first half of the 19th century, as drunkenness and its social consequences increased, temperance societies formed in Great Britain and the United States. These societies were typically religious groups that sponsored lectures and marches, sang songs, and published tracts that warned about the destructive consequences of alcohol. 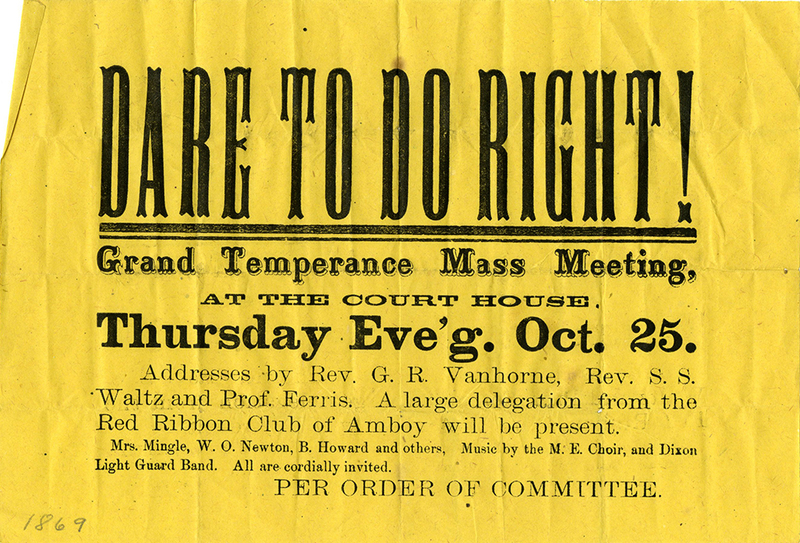 Eventually these temperance societies began to promote the virtues of abstinence or “teetotalism.” By the 1830s and 1840s many societies in the United States began asking people to sign “pledges” promising to abstain from all intoxicating beverages. Handbill published by the Virginia Anti-Saloon League, circa 1900 (detail). After 1898 the Anti-Saloon League (ASL), a men’s organization strongly supported by Protestant ministers and congregations, took over as the primary prohibition lobby in America. Led by Wayne Wheeler, the ASL pioneered the use of “pressure politics,” a strategy that uses media, publications, and behind-the-scenes influence to persuade politicians that the public demands an action. Unlike the WCTU, which was guided by Francis Willard’s “do everything” philosophy, the ASL under Wheeler focused entirely on the goal of passing Prohibition–using whatever tactics were necessary. The Eighteenth Amendment was passed by Congress in 1917, ratified in 1919, and went into effect at 12:01 am on January 17, 1920. The temperance movement had triumphed. Their victory was short-lived, however, as many Americans made and drank alcohol in violation of the law. Bootlegging and organized crime stepped in to profit from the market for spirits, while law enforcement lagged behind the rise in criminal behavior. Prohibition was unsustainable. In 1933 the Twenty-First Amendment repealed the Eighteenth, and manufacture, sale and consumption of alcohol again became legal in the United States. Andersen, L. (2011). Give the ladies a chance: Gender and partisanship in the Prohibition Party, 1869–1912. Journal of Women’s History, 23(2), 137-161.
when did the temperance act start and end? You can find this out with a bit of research into the “National Prohibition Act” (also known as the Volstead Act) and both the Eighteenth and Twenty-first Amendments to the Constitution. Good luck! See the suggested citation above. The publisher is the Social Welfare History Project.